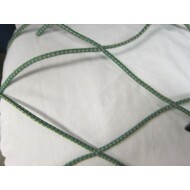 Elasticated Cargo nets are an ideal solution for securing light loads on vehicles and trailers. 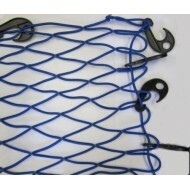 The elasticated mesh net stretches across your load and can be easily secured into place with the attached plastic hooks. 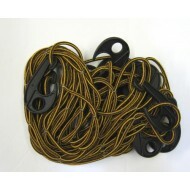 These nets are available in a range of colours with varying mesh sizes and bungee cord diameters. They are UV stabilised and have a good degree of stretch and flexibility. The elastic is high quality and retains its elasticity very well. These durable nets are made with elastic bungee cord and come complete with plastic hooks spaced at regular intervals around the periphery of the net to make the net easy to secure around the load. The nets are able to adapt to fit around loads of varying sizes and dimensions, making it ideal for securing luggage and other items in a roof rack, car boot or on a trailer. By using a net, it helps to ensure the load stays in place and can help to minimise damage to the items whilst in transit. The minimum requirement is that the load restraint system must be sufficient to withstand a force not less than the total weight of the load forward, and half of the weight of the load backwards and sideways. A correctly selected and fitted elasticated cargo net can help to provide compliance with these regulations. 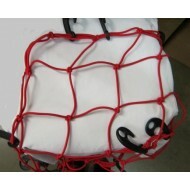 These durable nets are made with elastic bungee cord and come complete with plastic hooks spaced at ..